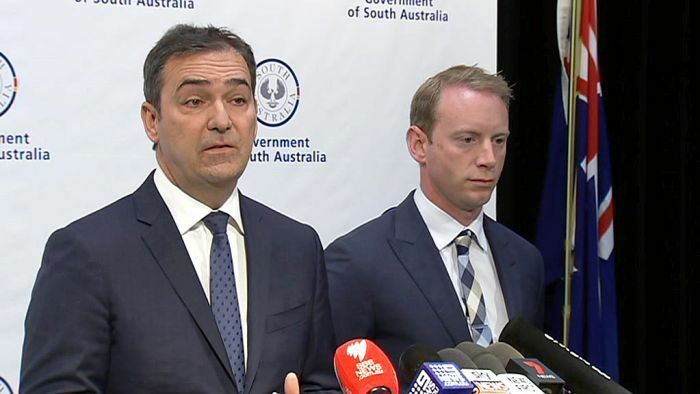 South Australian Premier Steven Marshall has slammed a royal commission’s scathing criticism of Water Minister David Speirs as “ludicrous” and “nonsensical” in Parliament. Last month, the Murray-Darling Basin Royal Commission handed down its findings and accused Mr Speirs of capitulating to other basin states during a ministerial meeting in December, 2018. On the first day of State Parliament for the year, Mr Marshall denied claims that Mr Speirs had breached the ministerial code of conduct. “With due respect to the royal commission, that is ludicrous and a nonsensical comment,” the Premier said. Amid loud interjections, Mr Marshall told Parliament the clause the commission was referring to “requires a minister to give consideration to the merits of the matter at hand and the impact that the decision is likely to have on the rights and the interest of the people involved and the citizens of South Australia”. “That’s what it says, and that is exactly what our Minister did,” he said. Outside Parliament, without the cover of parliamentary privilege, the Premier refused to repeat the comments. “I made those statements,” he said. “They’re on the public record. Mr Speirs attended a meeting in December where it was agreed that up to 450 gigalitres (GL) of water would be returned to the environment, provided it did not have a negative socio-economic impact on river communities, based on criteria agreed to by the states. Commissioner Bret Walker said that agreement was not in South Australia’s best interests. “It is nothing short of a capitulation to the interests of the current Commonwealth Government, and those of Victoria and New South Wales,” he said. Mr Marshall also told Parliament that Mr Speirs was not interviewed about the December negotiations and was therefore denied a fair hearing. “He has been subject to completely unjustified criticism and he has not received procedural fairness,” Mr Marshall said. Tom Koutsantonis tweets: Just an outrageous & cowardly attack on the Royal Commissioner by the Premier just now under Parliamentary Privilege. The Premier has labeled the Royal Commissioner’s conclusions as “Ludicrous”. I’ve never seen a Premier attack a Royal Commission like this, ever. Six Labor MPs were kicked out of the chamber for interjecting during the rowdy debate. The motion was for the Premier to request Prime Minister Scott Morrison call a Council of Australian Governments (COAG) meeting to consider the commission’s report and to endorse the Federal Government’s position that the Commonwealth and basin states “continue to work together in a genuinely bipartisan way to implement the current Murray-Darling Basin Plan in full”. Labor MP Tom Koutsantonis said his party was not pleased with the amount of notice it was given about the motion. “How can we possibly debate a motion that the Opposition was given less than half an hour ago,” he asked. Outside the Lower House, Labor environment spokesperson Susan Close said the motion did nothing to advance the issue. “We have serious questions to ask about the Minister and we have a very serious royal commission report that needs to be taken seriously,” she said. The Opposition was also accused of abandoning a pair arrangement to allow the Murray-Darling debate to even take place. Labor said the Government had agreed that one of its MPs would absent themselves from votes during the absence of Opposition MP John Gee. Later today the Legislative Council is expected to move to establish a committee inquiring into Mr Speirs’ conduct, and the advice he relied on in the December negotiations. Mr Walker declined to comment on the Premier’s statement in Parliament.